A Closer Look At Tongariro Crossing Weather. Tongariro Alpine Crossing weather can be a tricky to say the least. It can be difficult to forecast. It can be severe, and it can change at the blink of an eye. You're hoping for perfect weather on your special day. You've been keeping a close eye on the forecast. Here's a close look at Tongariro weather. To understand Tongariro's weather an understanding of New Zealand's climate is helpful. Take a look at a globe and you'll see the country lies between latitudes 34° south and 47° south. This means most of Northland is subtropical. The rest of the country is temperate. Which means there is more variety in temperature over the course of a year and more defined seasons. The average temperature for the North Island is around 14°C. Cold fronts are common place with the West Coast and South Coast of the South Island taking the brunt. Taranaki and the Central Plateau volcanoes also take their fair share of beatings. As you might well know the Pacific and Tasman Oceans surround New Zealand. Those are two big oceans encompassing these little islands. These big oceans temper prevailing temperatures and produce a pretty moist climate. Which means a high relative humidity and cloudiness. It comes as no surprise the Maori name for New Zealand is Aotearoa. The common english translation being "the land of the long white cloud". The big big picture is about the Southern Oscillation. This weather system influences the entire Pacific Ocean. In simple terms it is a circuit of high pressure air and low pressure air. The high pressure is forever moving towards the region of low pressure. The circuits eastern flank is the Peruvian Current which lies off the west coast of Peru. The western flank is north western Australia. The Trade Winds, sea levels and temperatures are other important components. You might of heard of El Nino and La Nina. These terms describe the strength of the circulation and the direction. And give a rough guide of what weather to expect for the coming seasons. NIWA, the National Institute of Water and Atmospheric Research provides a seasonal outlook. The Central Plateau lower elevation is about 800m above sea level (AMSL). Mt Ruapehu rises to 2797m. Mt Tongariro 1978m. And Mt Ngauruhoe 2291m. Mixing mountainous terrain with the New Zealand climate makes for interesting weather. It can snow on the Crossing during summer. I can be fine and clear, with little wind. It can be hot and dry. It can rain. The forecast can be completely wrong. The weather can change from good to bad with little notice, or the other way round. You need to know it rains a lot on the Tongariro Alpine Crossing. The average monthly rain fall for the 2017 season was 425mm*. To put this in perspective, Fiordland National Park gets an average of 580mm per month. Fiordland is one of the wettest places on earth! On the Crossing it rained 92 days out of the 180 days. That's like every 2nd day it rains! The Tongariro volcanoes force moisture up from lower elevations. Adiabatic cooling happens as the moist air gains elevation. Relative humidity often rises to 100% creating clouds and rain. This can happen on the Tongariro Alpine Crossing faster than you can say jack rabbit. All it takes is a slight change in temperature towards dew point and cloud forms. And then the heavens open up. This can happen in an instant, even on a fine day with a good forecast! Because the weather can change fast, you must take a good rain jacket! If you get soaked to the skin at 1600m above sea level and the temperature drops you can get into trouble. Best case scenario you'll be cold and wet. And not very happy. Worst case scenario you could get hypothermia. And that wouldn't be good! It blows a lot on the Crossing. Wind that is. The average wind speed for the 2017 season was 30km/h. The highest part of the track is the Red Crater. Strong winds can make this part of the track dangerous. The track is quite narrow at the apex and drops away to the bottom of Red Crater. There are no safety barriers or much else to stop a fall. Ending up in Red Crater would spoil your day, and most likely your life. When the wind is forecast to be greater than 65km/h, most shuttle operators will cancel their service. During the last season this occurred every 3rd day on average. The prevailing wind is from the west. Regions exposed to the west experience more cloudiness and rain than those to the east. The western flanks of the Tongariro Alpine Crossing are no exception. The start of the Crossing can often be in cloud in the morning. But if your're lucky, you'll push through the cloud at Red Crater to fine clear weather. North Westerlies are most often associated with a pre-frontal weather system. This happens when a cold front is travelling north east. Stuck in a trough between an eastward moving high pressure system. Cirrocumulus and/or Altocumulus forms on the West coasts of both islands. Concentrated on the South Island and around Mt Taranaki in the North Island. Cloud then thickens along both coasts of each island. The Tongariro volcanoes become covered in middle cloud as the systems develops. The cloud lowers as the trough approaches. When a south westerly blows a build up of cumulus clouds will happen along the west coasts of both islands. The weather can be fine and cold outside these cloudy areas. 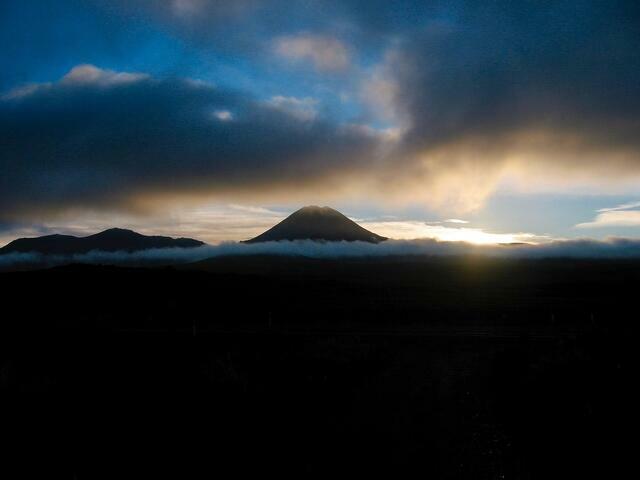 The Tongariro volcanoes will experience scattered to broken cloud formations. Concentrated in areas facing south west. The wind blowing from the southeast is quiet rare. It normally develops due to an associated pressure system. Typical of other cold and unstable air streams. Extensive cloud and precipitation can be part and parcel. This happens when the flow is part of the western flank of a deep and slow moving depression. Situated east or southeast of the country. During winter and early spring snow can fall on the Tongariro volcanoes. Any easterly wind can be a nuisance for the Tongariro Alpine Crossing. Especially after wet periods. The Kaimanawa Ranges and neighbouring ranges act like ramps. The wind pushes warm moist air up, it condenses and forms cloud on the Crossing. It can be a fine day in the National Park. But the Crossing can shrouded in thick cloud. A real nuisance. It can be cold too. How does fog effect the Crossing? Fog affecting the Crossing is not a common occurrence. Fog forms when the difference between air temperature and dew point is less than 2.5 degrees Celsius. Dew point is the air temperature below which water droplets begin to condense. Wind will be light, less than 5 km/h. Fog can form quickly and can be gone just as quick. Fog is not a big problem on the Crossing. It can effect the start of the day but you will either drive out of it travelling up Mangatepopo Road. Or you will walk through it. Once the sun is up the ground beneath the fog heats up. The fog then "burns off" as the water droplets evaporate to become water vapour. Lightning, thunder and heavy rain! Thunderstorms can cause havoc with heavy rain, strong winds and lightning strikes. Luckily the number of times the Crossing experiences thunderstorms is few per season. Moist warm air rises above high surface temperatures in unstable air. As it rises and cools the moist air condenses forming water droplets. Cumulonimbus clouds develop and then comes the rain. Lightning and thunder may well follow. It is not pleasant being out in the open during a thunderstorm. Being on a mountain, especially on a high point would be foolish. If the Tongariro Alpine Crossing forecast is predicting thunderstorms beware. Generally a thunderstorm will build early to mid afternoon. If you choose to do the hike, aim to be off the mountain by this time. How hot or cold does it get on the Crossing? The average temperature for the 16-17 season was 6 degrees Celsius*. The start of the Tongariro Alpine Crossing is 1100m above sea level. So it is not unusual to have a frost first thing in the morning, even during summer months. It can also get very hot on a fine day during mid summer. Once your're reached South Crater there is little protection from the sun. The New Zealand sun is pretty intense so sun protection is a must, plus plenty of water. If you don't like the heat it's best to start early. If you start early enough it's possible to complete the ascent before the suns starts baking. On a hot day expect temperatures to be greater than 25 degrees Celsius. It's easy to underestimate how cold it can get on the Crossing. Where ever you stay the night before Red Crater will be about 1km higher in elevation. If you stay in Taupo or Turangi Red Crater will be almost 1.5km higher, Ohakune; 1.3km, Whakapapa; 800m, National Park 1.1km. We can assume a temperature lapse rate of 1.98 degrees Celsius per 1000 feet. This means it will be about 6.5 degrees Celsius cooler than the temperature in the surrounding towns. It will be about 10 degrees Celsius cooler on Red Crater than Taupo's temperature. The difference can be a lot greater than this. And with a strong wind can feel a lot cooler. Can you rely on the Tongariro National Park weather forecast? Short answer: no! The Tongariro Alpine Crossing weather forecast is only a computer generated estimation. Often it is wrong. So it's important to be well prepared for all weather. The weather can change quickly from good to bad, and vice versa. If the forecast is for fine weather you must still pack wet weather gear and warm layers. If the forecast is for bad weather you should still take sunscreen. It's a good idea to seek good local advice about the weather and the forecast before setting off. Real time actual weather observations can be a great help. Especially if it's from an experienced local. This is one helpful advantage of staying close to the start of the Hike. Whakapapa and National Park are the closest villages to the start. The Metservice Tongariro National Park forecast is the most popular guide. It gives weather predictions for Red Crater for morning, midday and evening. For surface air pressure, surface wind, and rain predictions Metvuw is also helpful. There are also wind speed predictions at different heights. This web site is not as user friendly as the Metservice site. But it has a lot of great information. Used together with Metservice it can be helpful. Know the weather can change fast! It is critical you understand the weather can change fast in the mountains. It can change from good weather to bad weather without notice. You can start the hike with a glorious sunrise, and be walking in rain not long after. Or the other way round. Of coarse this does not happen every day but it can happen. So what should you do about this? Prepare for all weather when packing for the Crossing. Simple. 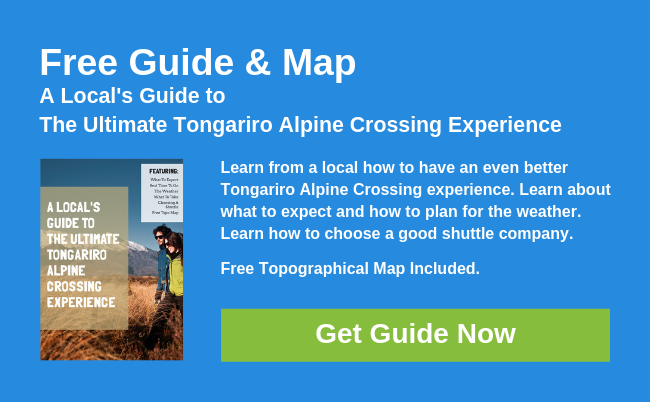 When is the best time to do the Tongariro Alpine Crossing? Generally, weather in mountainous areas will be better in the morning. In the afternoon there can be more cloud build-up and stronger winds. Which tends to be at it's most between 2pm & 3pm. This is not the case every day. The weather is generally better during the summer months than during winter. Over the years, the months of February, March & April are the most settled. But good settled weather can happen any time. November is a nice time to hike the Crossing. It can be a little quieter. And there can be remnants of snow surrounding the lakes and craters. This creates another contrast and can be very beautiful. Autumn can also be very nice. Once again the track can be a little quieter. It is hard to beat a clear autumn day on the Crossing. Snow and ice cover the track and lakes in winter. Unless you have good alpine experience, you need a guide during this time. Completing the hike during winter can be an unforgettable exhilarating experience. Know Tongariro Alpine Crossing Weather before you go. Know the weather forecast can be wrong. Know the weather can change fast. Know you need to prepare for this. There's a chance the weather will not be perfect on your special day. It is a mountain environment after all. So if you can, plan 2 or 3 days in Tongariro. Plan alternatives to the Tongariro Alpine Crossing, in case the weather is too bad to do the hike. And, make sure you pack essential gear for all weather conditions. *The season was November 2016 to the end of April 2017. Harvest Alarms provided statistics for this article. The weather station near Ketetahi Hot Springs is at approximately 1400m AMSL. The rain figures include snow and ice melt so are not accurate. The average temperature is measure over 24hours so includes night time temperatures.